Manhattan US Attorney Preet Bharara has secured a new Grand Jury indictment against Chinese billionaire Ng Lap Seng. 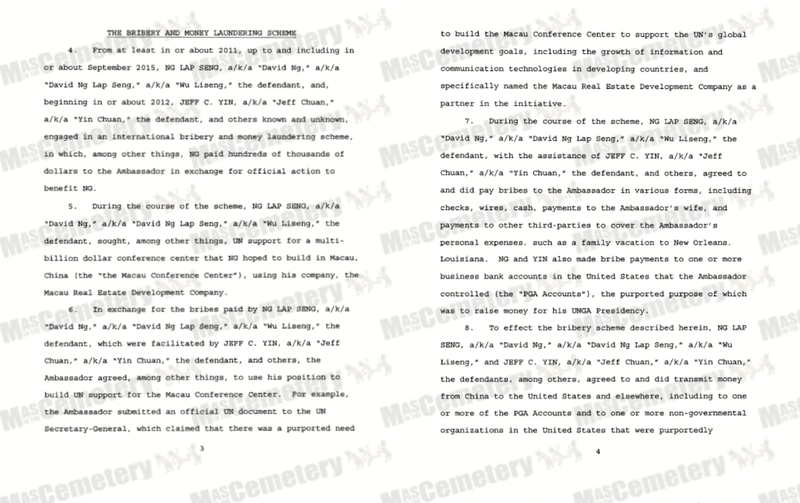 The four-count 15-page superseding indictment, unsealed in federal court on June 30th, alleges that Lap Seng engaged in a myriad of illegal acts in his attempt to get the United Nations to approve the construction of a UN center in Macau. 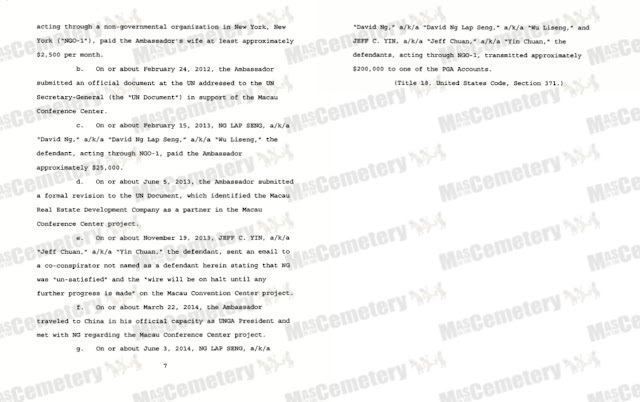 MiTC has a copy of the indictment, details below. Mr. Ng was first arrested in September of 2015 on bribery, conspiracy, money laundering and tax evasion charges. His arrest (along with his assistant Jeff Yin) occurred just 3 weeks after he was photographed with now-deceased former UN General Assembly President John Ashe, Francis Lorenzo, a former deputy Ambassador to the UN from the Dominican Republic who has pleaded guilty and is cooperating with prosecutors, and Dominica's Prime Minister Roosevelt Skerrit. The four were photographed signing numerous documents relating to the proposed UN center in Macau as well as a Letter of Commitment for the establishment of a Technology center in Dominica partially financed by Lap Seng. Mr. Skerrit has maintained a close relationship with the Chinese billionaire for over a decade. Lap Seng was instrumental in Mr. Skerrit's scheme to defraud Felix Chen of his investment in the defunct Layou River Hotel project. The scheme, which included multi-million dollar payments for concrete that was never delivered to the project site, enabled Mr. Skerrit, (together with a cast of supporting characters including Grace Tung and accountant Kieron Pinard-Byrne doing behind-the-scenes work), to successfully pick US$20 million out of Mr. Chen's pockets. Mr. Skerrit's enduring relationship with Mr. Ng brought him to Macau in August 2015 where the two men were photographed celebrating what has turned out to be Mr. Ng's UN bribery scheme. The event in Macau was billed as a poverty conference for low to mid-level government officials but Mr. Skerrit, the only head of state to participate, somehow found himself there, much to the surprise of a number of conference participants. 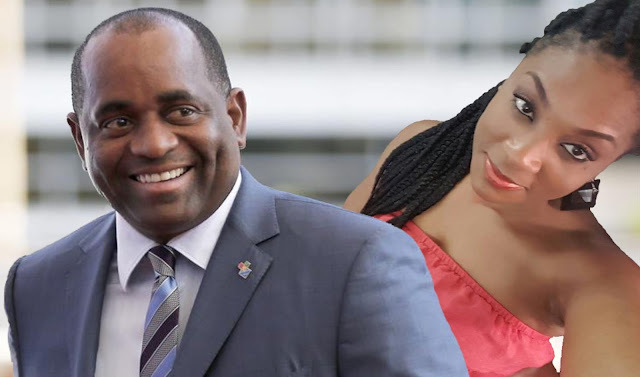 The event was not geared towards heads of government so the true purpose of Mr. Skerrit's appearance was greeted with a healthy dose of speculation. Within a month we had a firm grip of the true purpose of his visit. Three weeks after the Macau event Mr. Ng was arrested by the FBI in New Jersey just prior to boarding a jet to leave the States. Days later, Ashe and Lorenzo were arrested and the Feds began to lay out a complex scheme by Mr. Ng to bribe UN officials. The event in Macau, which Mr. Skerrit was part of, turned out to be a smokescreen for the bribing of officials of the UN. Federal prosecutors, in the new indictment, go into detail as to how the scheme was being operated. It is clear, but of no surprise to us, that the US Attorney's office is doing a meticulous job investigating this bribery scheme. The Grand Jury lays it out in detail. 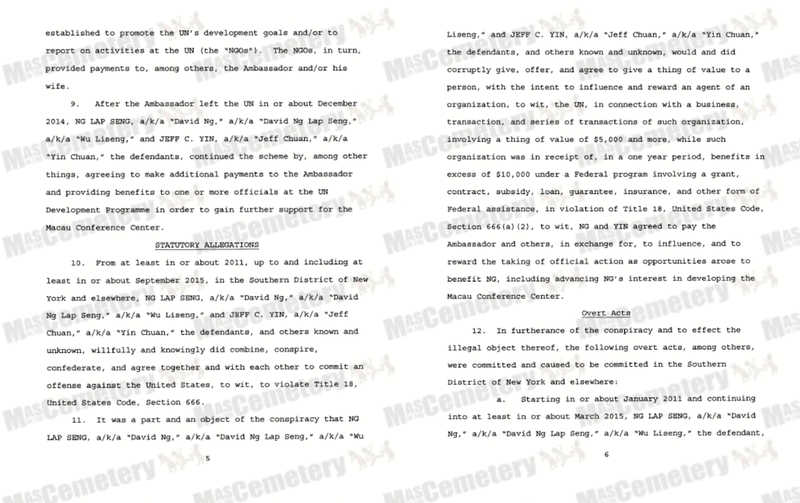 The indictment alleges that from about 2011 and up to September 2015, Ng Lap Seng, Jeff Yin "and others known and unknown, engaged in an international bribery and money laundering scheme, in which, among other things, NG paid hundreds of thousands of dollars to the Ambassador in exchange for official action to benefit NG". The Ambassador referenced is John Ashe, deceased. The indictment continues "During the course of the scheme, Ng Lap Seng...sought among other things, UN support for a multi-billion dollar conference center that NG hoped to build in Macau, China, using his company, the Macau Real Estate Development Company". "In exchange for the bribes paid by Ng Lap Seng, which were facilitated by Jeff Yin, and others, the Ambassador agreed, among other things, to use his position to build UN support for the Macau Conference Center. For example, the Ambassador submitted an official UN document to the UN Secretary-General, which claimed that there was a purported need to build the Macau Conference Center to support the UN's global development goals, including the growth of information and communication technologies in developing countries, and specifically named the Macau Real Estate Company as a partner in the initiative". We pause here to note the language in the indictment quoted above, highlighted in red. 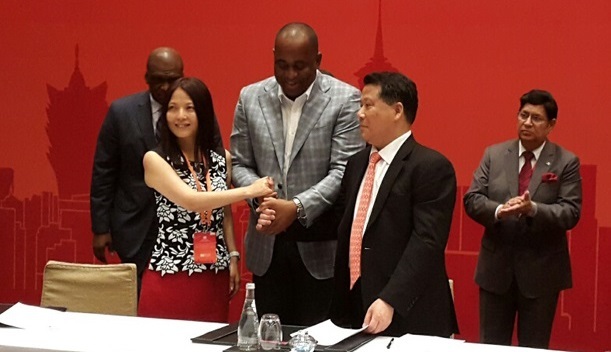 You will recall that at the Macau meeting Mr. Skerrit signed a Letter of Commitment (LoC) with Ng Lap Seng and Teresa Liu of the UN Office for South-South Cooperation (UNOSSC) for the construction of a South-South Technology Transfer facility for developing countries in Dominica. In reviewing the Grand Jury indictment we noticed a direct link between the commitments made in the LoC that Mr. Skerrit signed and the allegations laid out in said indictment. 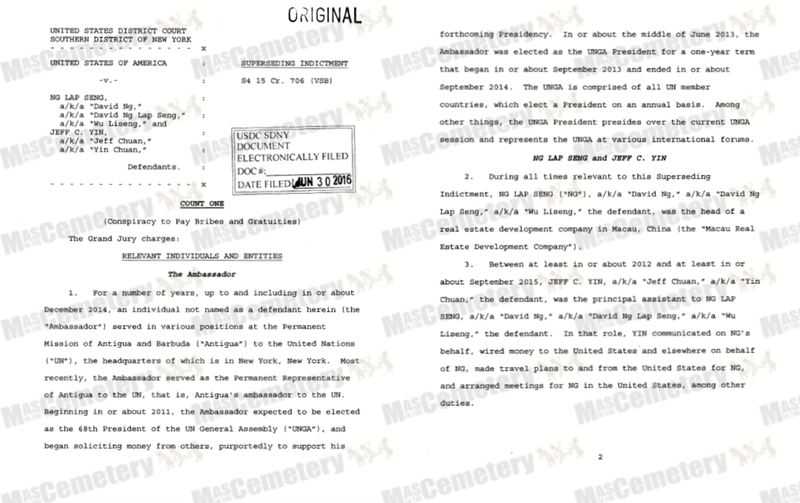 It appears to us that the facility Mr. Skerrit arranged to have built in Dominica was part of Mr. Ng's overall bribery scheme. The LoC does not commit Mr. Ng to pay for the facility, instead stating his company "commits herein to make a financial contribution, the amount of which will be determined upon final consultations with the signatories and other relevant stakeholders", leaving open the question of who would have really been footing the bill. It is not unreasonable to presume that the UN would have been the primary financier, since this would be a UN South-South facility, part of the UNOSSC. "To effect the bribery scheme, Ng Lap Seng and Jeff Yin, among others, agreed to and did transmit money from China to the United States and elsewhere...that were purportedly established to promote the UN's development goals and/or to report on activities at the UN (the "NGOs"). 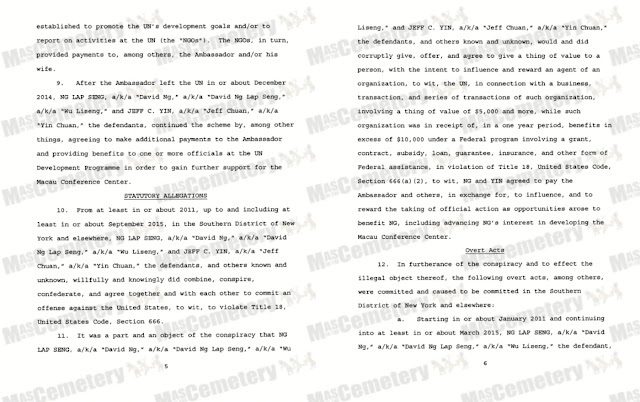 The NGOs, in turn, provided payments to, among others, the Ambassador and/or his wife". 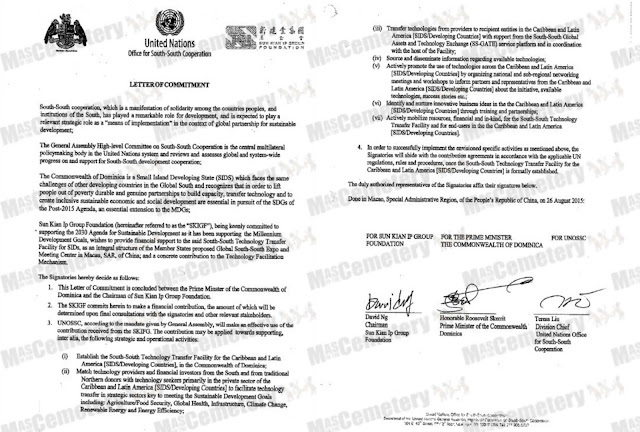 "After the Ambassador left the UN in or about December 2014, Ng Lap Seng and Jeff Yin...continued the scheme by, among other things, agreeing to make additional payments to the Ambassador and providing benefits to one or more officials at the UN Development Programme in order to gain further support for the Macau Conference Center". 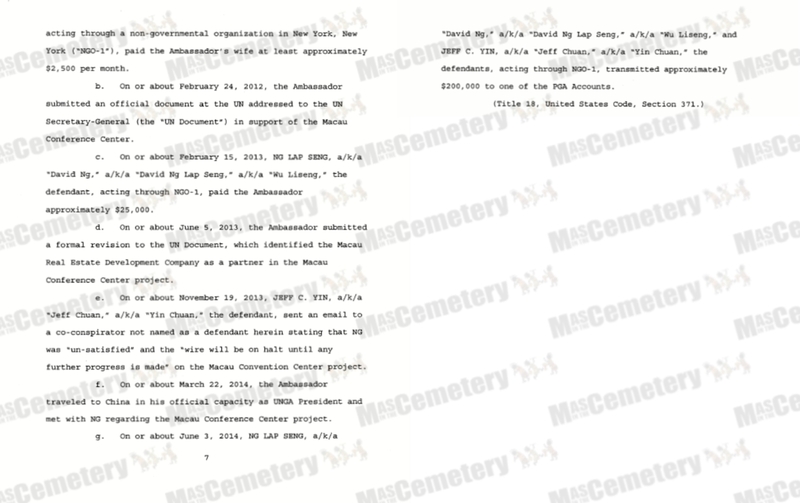 "Starting in or about January 2011 and continuing into at least in or about March 2015, Ng Lap Seng acting through a non-governmental organization in New York ("NGO-1"), paid the Ambassador's wife at least approximately $2.500 per month"
"On or about February 24, 2012, the Ambassador submitted an official document at the UN addressed to the UN Secretary-General in support of the Macau Conference Center"
"On or about February 15, 2013, Ng Lap Seng acting through NGO-1, paid the Ambassador approximately $25,000"
"On or about June 5, 2013, the Ambassador submitted a formal revision to the UN document, which identified the Macau Real Estate Development Company as a partner in the Macau Conference Center project"
"On or about November 19, 2013, jeff Yin sent an email to a co-conspirator not named as a defendant herein stating that NG was 'un-satisfied' and the 'wire will be on halt until any further progress is made' on the Macau Convention Center project"
"On or about March 22, 2014, the Ambassador traveled to China in his official capacity as UNGA President and met with NG regarding the Macau Conference Center project"
"On or about June 3, 2014, Ng Lap Seng and Jeff Yin, acting through NGO-, transmitted approximately $200,000 to one of the PGA accounts"
There are subtle references to "persons known and unknown" throughout the indictment. Who these persons are we do not know, but we know that US Attorney Preet Bharara will surely reveal the evidence when he sees fit. In the meantime we are left to wait. Defendants Ng Lap Seng, Jeff Yin, Francis Lorenzo, Shiwei Yan and Heidi Hong Pao are scheduled to be in court again on July 11th to discuss anticipated motions in the case. John Ashe, who would have been included, is released and the court has ordered all travel restrictions, if still existing, on his family be lifted. Also up for discussion is the request by the government for a Curcio hearing regarding Lap Seng attorney Hugh Mo. The government wants to inform the court about what appears to be potential conflicts of interest with Mr. Mo, Mr. Ng and the Chinese UN Mission. We'll be paying attention.